With today's technology, almost anyone can make a podcast. With a little bit of patience and effort, your own podcast can be up and running in no time. Here, you’ll learn how to make podcasts on iPhone. Picking a topic for your podcast should not be a difficult task. There are many different topics for podcasts including comedy, crime investigations, beauty, entertainment, technology, and more. Pick what interests you and make sure you enjoy discussing it. Making a podcast should be something that is fun, not a chore. Don't be worried about people not being interested in your podcast. Chances are, if you're interested in your topic, there is probably a lot more people that are interested as well. Opinion allows you to record, edit, and publish your own unique podcast by only using your iPhone. It is simple and easy to use, which would make it great for someone who is just getting started with their podcast. Opinion allows a free ten minutes of recording, however, if you would like an unlimited amount, you can pay $3.99. Step 1: To start recording a podcast on Opinion, all you have to do is press the record button at the top left part of the screen. Step 2: After you finish recording, you can edit your podcast using the magnifying glass icon. If you would like to cut a section, move the dotted line to where you would like to cut. Step 3: Then, press the trash icon. You can also move around any of the audio clips by holding down the three-lined icon. When you feel like your podcast is complete, press the share icon at the top right to publish your podcasts. Audioboom is a great app for recording podcasts. Always formerly known as audioBoo. It provides users with a platform to create, edit and share their podcasts. Step 1: Navigate to your dashboard. Step 2: Tap on Upload/Record. This allows you to either select a previously recorded audio file, or start recording a new one. Step 3: After you've finished recording your podcast, edit it and choose a title for the podcast, add a description and category. If you chose to, you can also add a picture. Step 4: After you have added the necessary information, click Publish. The podcast size limit is 200 minutes per podcast session and 200 MB per file. Podbean is an easy-to-use podcast app for iPhone. It has a simple user interface and very basic controls. To make a podcast on iPhone is very easy, just follow these steps. Step 1: The first thing you have to do is sign up with your email address, you can also do this with a Facebook account. Step 2: To start recording your podcast, click on the red microphone button at the bottom left corner of the homepage. Step 3: Click on the red record button again to start recording your podcast. You can play or pause at any time, if you want to. You can also click on the play button to listen to what you recorded so far or you can click on the delete button to move it to trash. Step 4: If you want to edit or trim your podcast, click on the scissors icon. When you're done editing, click on the save button to export your podcast and share it. Note that the maximum recording time for podcasts is 90 minutes. Sometimes, transferring your podcast from your iPhone to computer can get a little tricky. That's where iMyFone TunesMate comes into play. iMyFone TunesMate is an app that allows the creator to transfer their podcasts from any apple device to their computer. This is an extremely useful app that makes transferring any type of media simple. If you are looking into making a podcast on iPhone, downloading iMyFone TunesMate is definitely a good step to take. You may want to make a podcast on iPhone and transfer them to your computer for professional editor. It makes the whole process easier and stress-free. It support all the media files including music, videos, photos, playlists, podcasts, audiobooks and 10+ more. 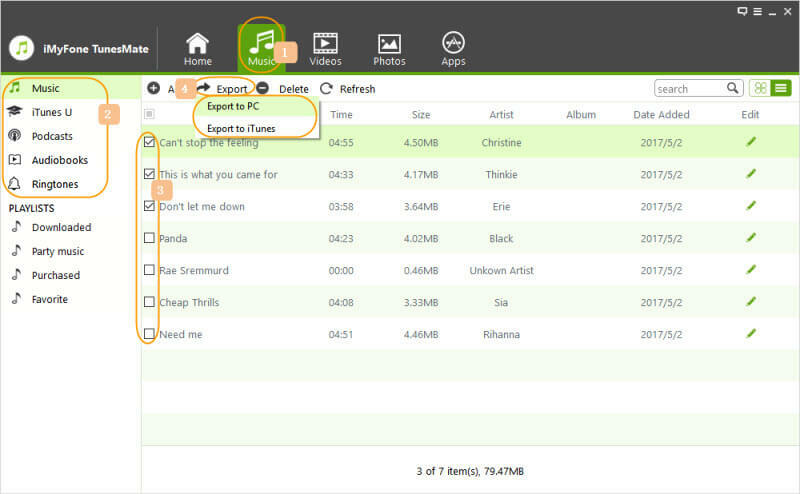 It allows you to transfer files from iPhone to iTunes/computer, or sync files from iTunes/computer to iPhone. Share iTunes music/podcasts with family or friends, even in different Apple IDs. Seamlessly sync iTunes library to iPhone without covering the existing files on iPhone. Step 1: Launch iMyFone TunesMate and connect your iPhone to your computer (Mac/Windows). Step 2: Click on Music tab and choose Podcasts at the left sidebar. 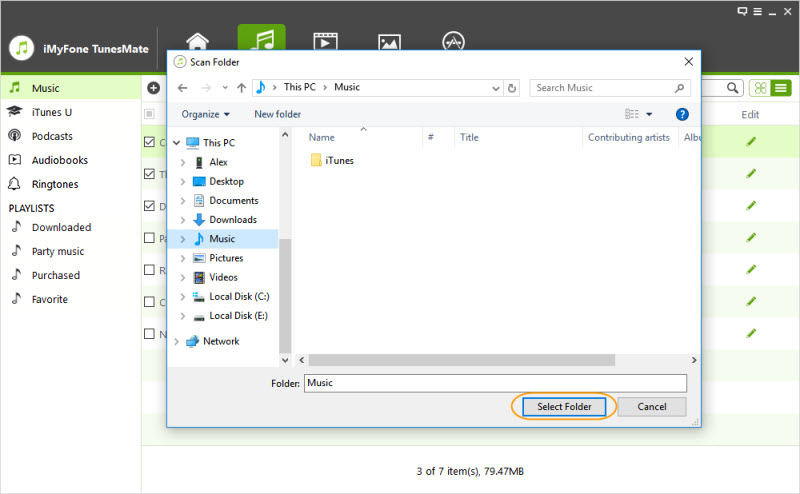 Step 4: Choose a folder to store your podcast and click on Select Folder to start the transfer process.